The following tip is a variation on a trick John Conners showed me, the difference being I’m using Dropbox as a temporary webserver instead of rolling my own. 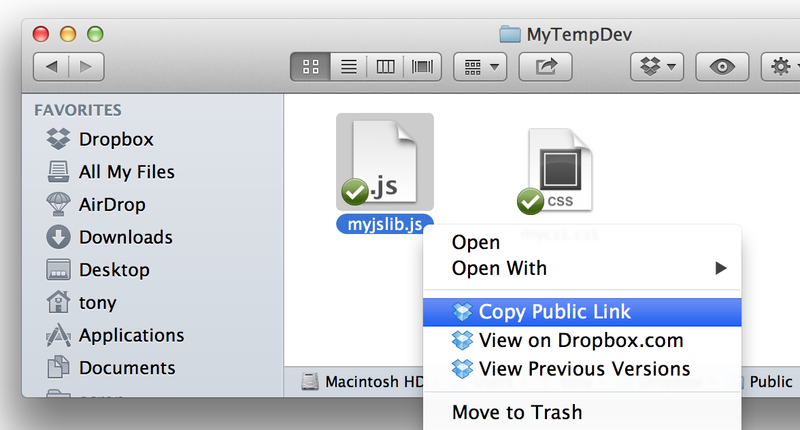 A much quicker way of working is to take your JS and CSS libraries out of your static resource and put them in your public Dropbox folder while you’re working on them. You can then code away in your favourite editor and save your changes direct to your dropbox in seconds, reload your VF page and test your changes. When you’re all set pop your scripts back, zip up your static resource and don’t forget to replace your temporary dropbox links with the static resource links.